As the General Assembly galloped toward crossover day -- the deadline for bills originating in each chamber have to be acted on by that chamber -- several bills affecting FOIA were still on the docekt. Since becoming VCOG's executive director, this is the fewst number of "bad" FOIA bills I've seen, and many good bills that may have been defeated in past sesions are still going strong. For instance, a Senate subcommittee that last year pushed through several bills to restrict access to public records this year advanced several bills that are designed to benefit the public. The full Senate General Laws & Technology Committee largely followed the subcommittee's recommendations. The House General Laws committee also adopted many bills aimed at improving the FOIA process, including the omnibus FOIA revision bills to come out of the FOI Advisory Council study. On the other hand, the House General Laws Committee advanced a bill that would make it a Class 1 misdemeanor for a police department to release the name of an officer invovled in a shooting or excessive force investigation for at least six months. And it defeated a bill to require a public comment period at most open meetings. A bill to restrict access to juror information was tabled early on, but it was revived in a much narrower form and passed 10 days later. And citizens many receive protection from a lawsuit filed to punish them for speaking out on a matter of public concern. House and Senate committees have passed amended versions of these so-called anti-SLAPP bills, though there's disagreement over whether the protections should extend to consumers who write negative reviews of various products or services. that such an archive would be posted during the 2017 session. The archive is posted to the website from which the livestream of the House floor session can be viewed. It lists each day’s session, its duration and the options to watch online or to download the video. The site also includes a search function that allows users to search videos for keywords (try searching “FOIA”). Without fanfare, the Senate followed suit with the list of archived sessions but it does not include a search function. 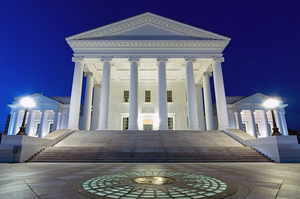 Following the 2015 Transparency Virginia (TVa) report showing that of the bills killed in House subcommittees, 76% of them were defeated on an unrecorded voice vote, Del. Ben Cline introduced a bill in 2016 to require all bills to receive a recorded vote. The bill was defeated in the House Rules committee . . . on an unrecorded voice vote. TVa’s 2016 report showed the percentage of unrecorded voice votes climbed to 95, and in 2017, Cline introduced another bill requiring a recorded vote. And again, the bill was defeated on an unrecorded voice vote. The real nitty-gritty of the legislative process takes place in the subcommittees and committees. But if you're not there in person, you're not going to know much beyond whatever gets reported in the press. Progress Virginia, an advocacy group, rounded up a herd of volunteers to sit in on these committees to stream the meetings on four separate channels on a website run by the group. The picture and sound aren't always great -- volunteers usually use just their own smart phones and a plug-in microphone -- but they're good enough for citizens all over the commonwealth to watch their elected officials in action. At its first meeting of the year, the Portsmouth City Council voted to eliminate the rule it adopted in 2015 to fine a city council member $1,500 who publicly reveals the contents of a closed session. Three weeks later, Councilman Bill Moody said he would drop his lawsuit over a fine assessed against him in 2016. The city agreed to pay Moody’s attorney, Kevin Martingayle, $10,000 in fees for his legal services in challenging the rule. There was discord among members of the Prince William County School Board when two members wanted to call a special meeting to discuss a board of supervisors resolution on new construction. The school board chair said such a meeting call was out of order. Nonetheless, after walking out of the room at the regular meeting’s conclusion, the chair returned and gaveled in a special meeting where the construction resolution was discussed. But it wasn’t quite over. At its Jan. 18 meeting, the board voted 4-3 to strike the minutes and “associated votes” from the so-called special meeting. At least three members the Franklin County School Board said they were surprised to learn that the board chair directed the school superintendent to send a FOIA request to county board of supervisors for documents and feasibility studies on various county projects. One said it was her belief that the the request shouldn’t have been made without consent of the full board. Bedford County’s IT director asked the county for more than a half million dollars to install a new system to replace he called antiquated and faulted for a number of problems like information security breaches, dropped calls, slow and unreliable network performances, virus outbreaks and inability to recover documents from hardware and software failures. In reporting on homicides in the area, The Roanoke Times learned that police do not always disclose a complete list of cases. There’s no law or Virginia State Police policy on when a department should notify the public. Police Chief Tim Jones said the department has a responsibility to notify the public of a homicide in two scenarios: if a death resulted from an incident that posed a threat to the community, like a shooting, or if someone is charged or indicted by a grand jury after a homicide takes place. At the end of every year, the department releases an annual tally of homicides. Citizens in Bath County lost their court bid to remove three members of the board of supervisors over what the citizens called an illegal closed meeting that led to the elimination of the county’s director of tourism. Judge John Wetsel said that FOIA violations are insufficient to justify removal of a public official in part because FOIA carries its own enforcement penalties. The Virginia Press Association is creating a website where people can search for public notices published by newspapers across the state. The organization, a trade group for newspapers in Virginia, is planning to introduce the PublicNoticeVirginia.com website in April. It will include legal notices routinely published in newspapers and issued by government agencies and private entities such as law firms, contractors and utilities. Those include public meeting notices, foreclosure notices, requests for bids on contracts and proposed zoning changes. The Newport News City Council went into closed session to discuss appointments to various commissions. When the members emerged, they voted to “ratify” the positions they had discussed in the closed session without naming who had been picked or which positions were considered. A Cedar Bluff man made national headlines for carting in five wheelbarrows full of pennies to pay tax on two cars. The move was the final shot in a battle between the man and the DMV over access to the Lebanon office’s direct number, rather than the number that forwarded calls to the state DMV office, to get an answer on a tax question about the vehicles. He filed a FOIA request for the direct number to nine other local offices and went to court when he was denied them. The cases were dismissed when the DMV turned the phone numbers over. The Virginian-Pilot and ProPublica filed a lawsuit in federal court against the U.S. Department of Veterans Affairs, accusing the agency of stonewalling requests for documents under the Freedom of Information Act about Agent Orange. The Virginian-Pilot was granted access to the juvenile court hearings of two teenagers charged in connection with a series of shootings. The judge, however, ordered the Pilot not to publish the names of any defendants, victims or civilian witnesses referenced in the proceedings. A Newport News circuit court judge rebuffed a FOIA lawsuit filed by the owner of a restaurant ousted from the Newport News/Williamsburg International Airport over the amount the airport charged him to obtain records under FOIA. Thomas G. McDermott asked the court to cut the $3,370 charge to $300 and challenged the $151/hour for the airport director’s time to review the requested records. At the court hearing, the airport admitted that the rate included the director’s base salary, retirement pay, Social Security payments, vacation time, car allowance, and medical, dental and vision care. Richmond Sheriff C.T. Woody Jr. will face monetary sanctions and other penalties for failing to preserve video evidence in the case of a 28-year-old woman who died at the Richmond City Justice Center in August 2014.